Established in 1945 Vaishya Sahakari Bank has successfully completed 73 years on 12th Nov. 2017 serving the best to society. Last 13 years have been of excellent performance. Audit Class A by Co-Operative Department in F.Y. 2017-18. 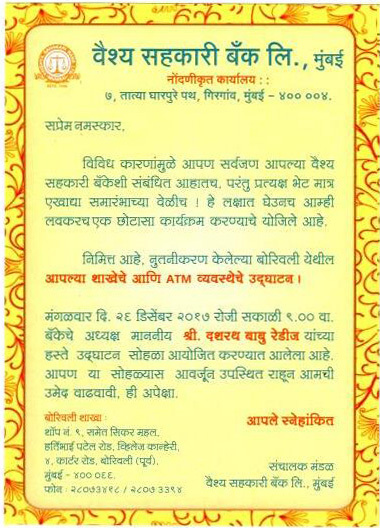 Introduction of ATM & Rupay Debit Card. The Bank proposed dividend @7% in F.Y. 2017-18. Implimentation of Personalized Cheque Book.